Spirituality, huh? There is a case to be made for it being essential for existence not unlike a fire is for a candle. Some would claim the same for art and even go a step further claiming that art is not merely what is seen but what it makes other see, which make it come full circle and links it to spirituality. 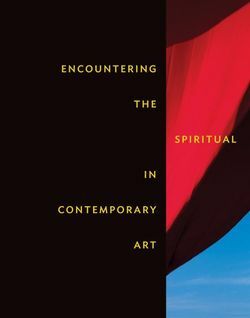 Encountering the Spiritual in Contemporary Art is a tome focused – as the telling title suggests – on the linkages between spiritual elements in art of the last three decades. What I found interesting is that it extends its scope far beyond the confines of merely Western art and reaches into Indigenous and other cultures, which depending on the specific culture are at times centred around spiritual motives. In essence, the book is a celebration of diversity and plurality with not merely depicting artworks but substantiating them with well-researched elaborations, which tackle sujets from different angles to provide a holistic outlook that is calibrated at a level which should hold the interest of both academic as well as general audiences. It goes deeper that mere face value level examinations of mainstream art and refrains from preaching to the converted: There is no need to be a spiritual person to be intrigued by the subject matter and, as a matter of fact, the book specifically appeals not only to believers but also agnostics and sceptics alike by addressing fundamental questions that concern all of us, which serves as a common foundation and denomination for the essays. If you are into art for more than mere aesthetics and “art pour l’art” this one is something that you should not go without in your library.